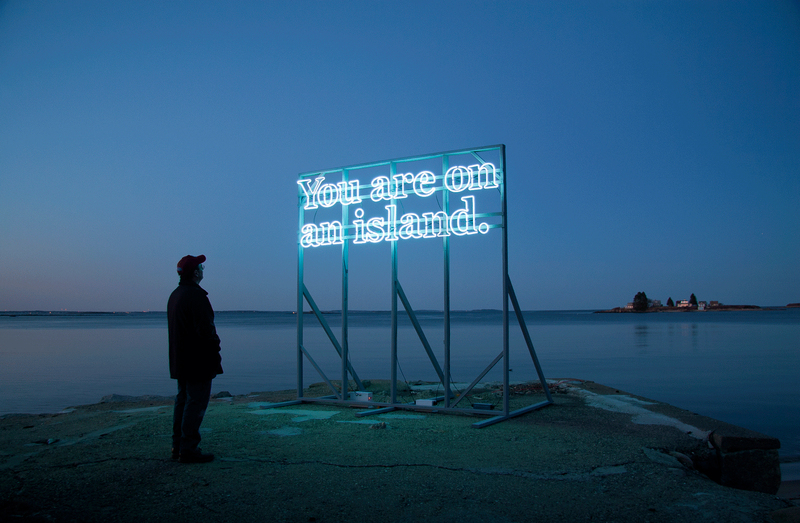 Chattanooga and Nashville - Number: Inc.
Alicia Eggert and Mike Fleming, You are (on) an island, 2011-2013, 120” x 120” x 96”, steel and neon. Featured in LAND AND SEA, Stoveworks. Photo by Mike Fleming. The first in a series of five, LAND AND SEA examines that which is seemingly familiar. Through sculpture, video, painting, and sound, LAND AND SEA questions human interaction and interference with fundamental natural resources—water, air, and soil—specifically in the context of Chattanooga. Each exhibition allows its content to extend beyond the given limits of the gallery. The series is a collaboration between Stove Works and Atlanta Contemporary and shows from August 9 through September 10 with the remaining four shows following throughout the fall and into the spring of 2019. As the permanent Stove Works location is currently under construction, the shows will take place nearby at 1155 East Main Street in Chattanooga. I look forward to The Hunter Invitational IV at the Hunter Museum of American Art, an exhibition comprised of eight artists from various cities in Tennessee and Georgia, organized by Chief Curator Nandini Makrandi. I am especially excited to experience the work of Chattanooga artist Amanda Brazier. Her work investigates relationships between humans and the natural world as well as processes of establishing and inhabiting shelter. The work invokes a sense of protection as she builds layer upon layer, constructing paintings that repeatedly envelop you, alleviating instability through her harmonic arrangements. Introducing new perspectives on space, environment, and identity, Persona (Spanish for person) is an exhibition of work from various Nashville-based artists, performers, and poets at Tournament Studios in Nashville on August 11. Curated by Andrés Bustamante, the exhibit examines what it means to be a human being, specifically within a marginalized community affected by zero-tolerance immigration policies and Tennessee’s Hb2315 anti-immigrant laws. Igniting tangible change and social impact, work sold at the show benefits the Tennessee Immigrant and Refugee Rights Coalition (TIRRC). Finally, I greatly anticipate the work of Kirby Miles and Alyssa Klauer in Reversing to Nowhere presented by artist-run space VERSA on August 18 in their second-floor space at the Mercy Junction Justice and Peace Center. I am intrigued by the pairing of Miles’ loud materials with the strangeness of Klauer’s portraits. The work of both artists in conversation promotes eerie humor, inhabiting a phantasmagoric realm of gaudy color and sticky textures. Author: Mary Paige Pepper is an artist and writer based in Chattanooga, Tennessee.